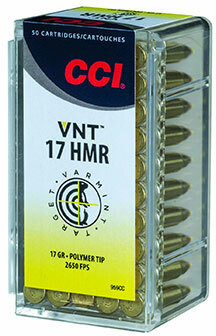 Devastate varmints or drill targets at long range with new CCI VNT. The 17 HMR loads feature a Speer bullet with an extremely thin jacket and polymer tip that team up to offer flat trajectories, superb long-range accuracy and explosive terminal performance on impact. It's the perfect combination for hunting varmints or shooting at the range.